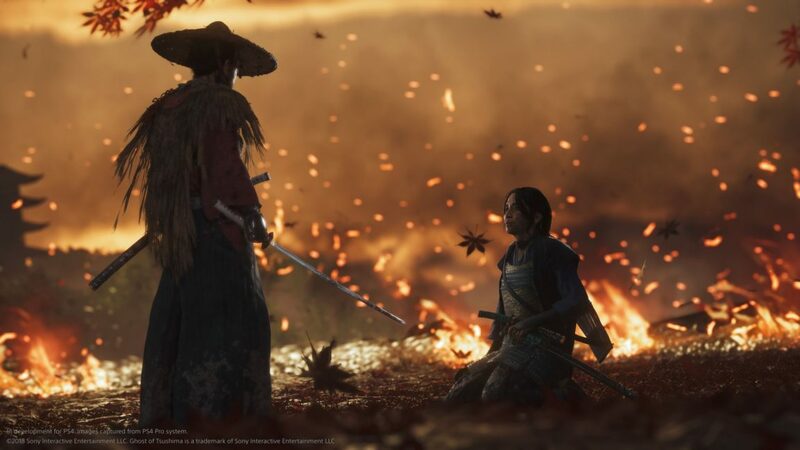 Ghost of Tsushima was one of the most visually stunning games at E3 this week, with its lush grass and sweeping landscapes, a cinematic recreation of 13th Century Japan slashed red with blood. Sucker Punch’s vision was close to an Akira Kurosawa movie, achieved by removing any trace of a traditional HUD on the screen – there was no health bar or weapon icons anywhere to be seen. Unfortunately that stripped back look isn’t the aesthetic the developer is going for with the finished game, as Sucker Punch has confirmed it will have all the usual screen furniture we expect from an open world brawling game. According to Sucker Punch’s Chris Zimmerman, the UI was removed so it didn’t distract players or prompt too many questions. “This isn’t going to be a UI heavy game, it’s not like there’s crap all over the screen. But this isn’t an artistic statement,” he said. “We take it out because otherwise I have to explain it all. We wanted to make sure the demo we’re showing is as distraction-free as possible. Zimmerman said there was no intention of tricking fans by not showing them features of the game, but it was more about getting feedback after showing it publicly for the first time. “It’s been an accidental experiment,” he said. “This was not an intentional thing to confuse people about whether we had no UI or not. One of the things that’s fun about E3 is you take the vision you had and put it in front of people and see what the reaction is. Ghost of Tsushima is a PS4 exclusive, but it doesn’t currently have a release date.